Blurb: 1954. “Vixen 03” is down. The plane, bound for the Pacific carrying thirty-six Doomsday bombs — canisters armed with quick-death germs of unbelievable potency — vanishes. Vixen has in fact crashed into an ice-covered lake in Colorado. 1988. Dirk Pitt, who heroically raised the “Titanic,” discovers the wreckage of “Vixen 03.” But two deadly canisters are missing. They’re in the hands of a terrorist group. Their lethal mission: to sail a battleship seventy-five miles up the Potomac and blast Washington, D.C., to kingdom come. Only Dirk can stop them. Review: I have already declared 2015 the year that I will be reading what I want, when I want. The pressure is off. No review copies will be coming in (unless they look really good …… I have no self-control, after all). So when I went “shopping” on my shelves for the first book to start off 2015 with, this was the one that stuck out to me. And I found it to be a really fun read. 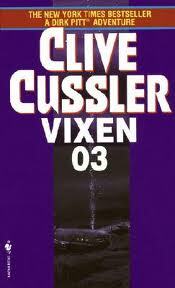 It really caught my attention from the beginning with Vixen 03 going missing and then Dirk finding it in Colorado. To be honest, I felt like the middle portion of the book was the weakest. I personally could have done without the African political storyline. It just made the book drag on in my opinion. When the story centered back on Dirk and the bombs, it picked back up again.